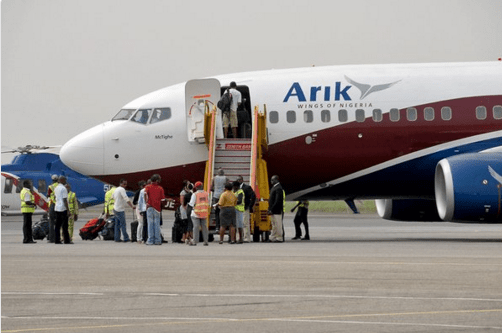 Hundreds of Arik Air passengers were left stranded at the Nnamdi Azikiwe International Airport, Abuja on Wednesday in the usual fashion of Arik air, they are known as chronic delayers lol. According to the Punch, the airline had operational hitches, which resulted in flight delays on different routes out of Abuja that lasted for several hours, as about four of its aircraft were on ground at the NAIA tarmac. It was further gathered that angry passenger on the Abuja-Owerri and Abuja-Benin routes were fed with biscuits and soft drinks by the carrier in a bid to calm tempers. Arik again, lol na wa. “This is past 4pm and people have been here since morning, waiting to board, but no way. The annoying thing is that some of the airline’s members of staff find it hard to explain why our flights are being delayed this much. This is horrible,” said an intending traveller on one of the delayed Arik flights, who simply identified himself as Austin. Another passenger stated that two persons were arrested after they had misunderstandings with officials of Arik, but the airline was quick to refute this claim, arguing that no one was arrested at its terminal in Abuja on Wednesday. A source at the Federal Airports Authority of Nigeria told our correspondent that hundreds of passengers of Arik Air were stranded at the airport as their flights were delayed for several hours. He stated that the airline’s first flight from Lagos landed at the Abuja airport around 4pm, whereas several flights of other domestic carriers were shuttling in and out of the NAIA without hitches. The official stated that Arik Air was denied aviation fuel, otherwise known as JetA1, by marketers because the airline was allegedly not paying for the commodity. “This is some minutes after 4pm and the first Arik Air flight from Lagos just landed here some minutes ago,” the FAAN official, who spoke on condition of anonymity, said. When asked what led to such operational lapses, the official replied, “About four of their aircraft are on ground and this is because marketers are not giving them fuel. The fuel marketers complain that the airline doesn’t pay for fuel. But the airline has been providing soft drinks and biscuits for its passengers since morning as they wait for their flights. When contacted, Arik Air’s spokesperson, Mr. Banji Ola, said there was no protest at the airline’s counter at the Abuja airport on Wednesday, adding that no one was arrested either. He, however, did not refute complaints of flight delays by the airline at the Abuja airport on Wednesday.